Were the Particular Baptists Anabaptists? No they were not, but let us allow the pens of their paedobaptist peers to answer the question. Stephen Marshall says that most Anabaptists he knows could not subscribe to the 1644 London Baptist Confession, that it is the most orthodox Anabaptists confession he has seen, and that it is very unlike the doctrines of the German Anabaptists. Daniel Featley says that if the 1644 confession is sincere, those who confess it are tenderhearted Christians who have been sorely abused. But obviously they must be lying. What would he correct in this confession? 1. Possessions are owned by nature, not by grace. 2. Tithing should be enforced. 3. Believers and their children should be baptized. 4. Baptizing includes dipping, washing, and sprinkling. 5. Only authorized ministers may baptize. 6. The nature of the prophecy mentioned in the confession needs to be clarified. Robert Bailie understands that the Particular Baptists reject the name of Anabaptism, claiming similarity only in their mutual rejection of paedobaptism. He also wishes that, taken at face value, the confession would be owned by all others called Anabaptists. Thomas Edwards (Gangraena) opines that this confession must be hiding their real errors, and that where the Particular Baptists hold to orthodoxy they cannot possibly mean it as the orthodox do. 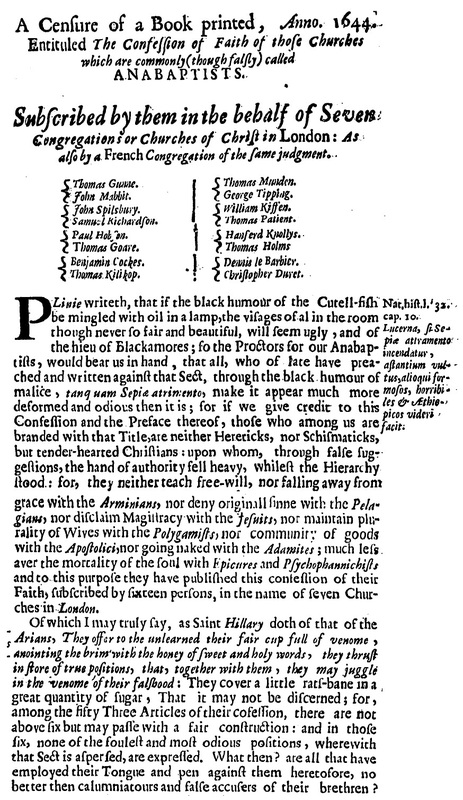 So then, according to esteemed men, including members of the Westminster Assembly, while the doctrines of the 1644 confession are orthodox (minus their obvious disagreements on Baptism and their small critiques on possession, tithes, and prophecy), the Particular Baptists were Anabaptists because they simply had to be lying. 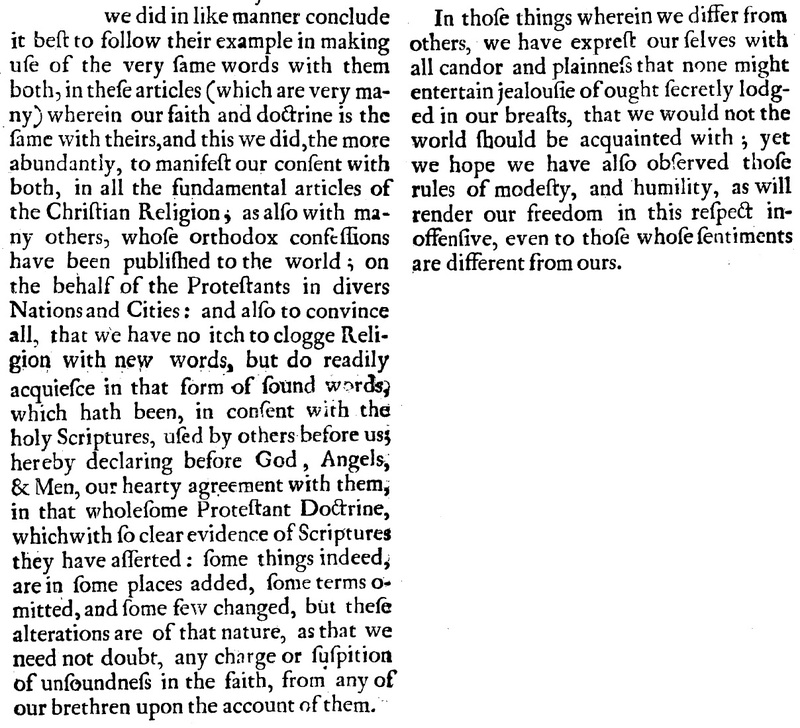 Did it make a difference that the 1646 confession refined these areas of ambiguity or misunderstanding? No, because they were lying Anabaptists. 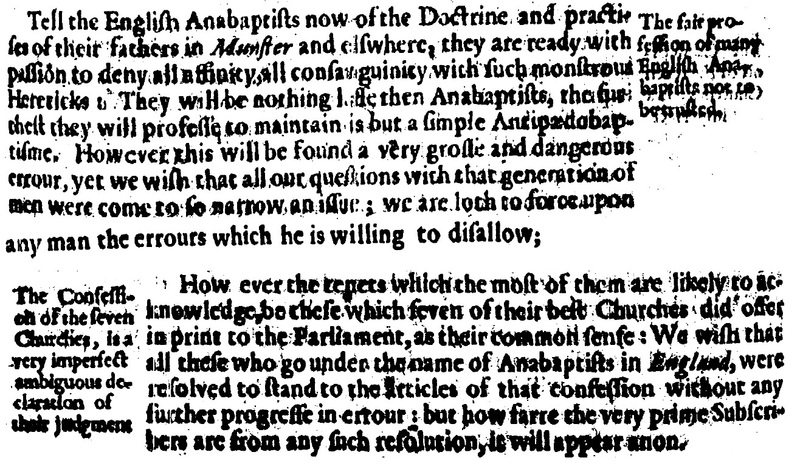 “And for what you alledge out of the London Anabaptists confession, I acknowledge it the most Orthodox of any Anabaptists confession that ever I read, (although there are sundry Heterodox opinions in it) and such an one as I beleeve thousands of our new Anabaptists will be farre from owning, as any man may bee able to say without a spirit of divination, knowing that their received and usuall doctrines doe much more agree with the Anabaptists in Germany, then with this handfull who made this confession here in London. “Plinie writeth, that if the black humour of the Cutell-fish be mingled with oil in a lamp, the visages of all in the room though never so fair and beautiful, will seem ugly, and of the hieu of Blackamores; so the Proctors for our Anabaptists, would bear us in hand, that all, who of late have preached and written against that Sect, through the black humour of malice, tanquam Sepia atrimento, make it appear much more deformed and odious then it is; for if we give credit to this Confession and the Preface thereof, those who among us are branded with that Title, are neither Hereticks, nor Schismaticks, but tender-hearted Christians: upon whom, through false suggestions, the hand of authority fell heavy, whilest the Hierarchy stood: for, they neither teach free-will, nor falling away from grace with the Arminians, nor deny originall sinne with the Pelagians, nor disclaim Magistracy with the Jesuits, nor maintain plurality of Wives with the Polygamists, nor community of goods with the Apostolici, nor going naked with the Adamites; much less aver the mortality of the soul with the Epicures and Psychophannichists and to this purpose they have published this confession of their Faith, subscribed by sixteen persons, in the name of seven Churches in London. “First, against those words in the Thirty one Article, Whatsoever the Saints of any of them do possesse or enjoy of God in this life, is by Faith. This passage savours rank of that errour of Heresie (call it which way you please) imputed to Armacanus, who is said to have taught that the right of all possessions and goods or temporall blessings, is founded in grace, not in Nature. Secondly, I except against those words in the 38, Article, that the due maintenance of the officers of the aforesaid should be the free and voluntary communication of the Church, and not by constraint to be compelled from the people by a forced Law. Thirdly, I except against the 39 Article. viz. that Baptisme is “an Ordinance of the New Testament, given by Christ to be dispensed only upon persons professing faith, or that are disciples, or taught; who upon a profession of faith ought to be baptized.” Here they lispe not, but speak out plain their Anabaptisticall doctrine; whereby they exclude all children of the faithfull, from the Sacrament of entrance into the Church. Fourthly, I except against the fortieth Article, viz. “The way and manner of dispensing this Ordinance, the Scripture holds out to be a dipping or plunging the whole body under water; it being a sign, must answer the thing signified, which are these; 1 The washing of the whole soul in the blood of Christ. 2. That interest the Saints have in the death, buriall, and resurrection of Christ. 3. Together with a confirmation of our faith, that as certainly as the body is buried under water and riseth again; so certainly shall the bodies of the Saints be raised by the power of Christ, in the day of the resurrection to reign with Christ.” This article is wholly sowred with the new leaven of Anabaptism. 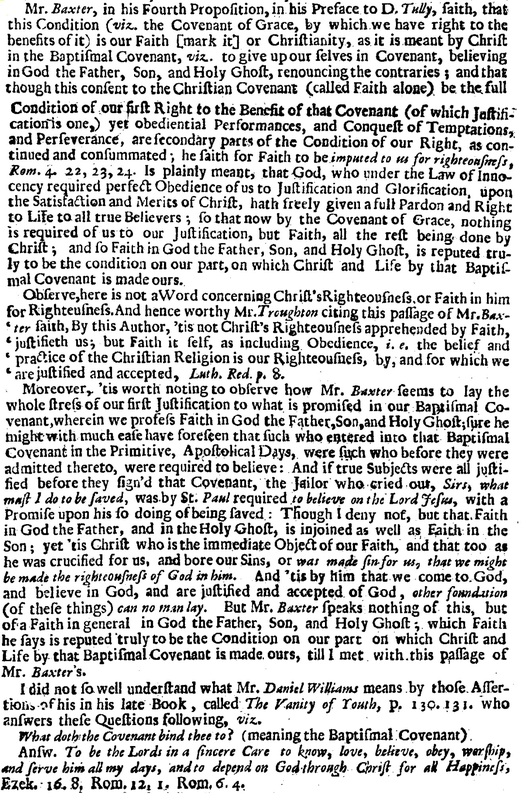 I say the new leaven, for it cannot be proved that any of the antient Anabaptists maintained any such position, there being three wayes of baptizing, either by dipping, or washing, or sprinkling, to which the Scripture alludeth in sundry places: the Sacrament is rightly administered by any of the three; and whatsoever is here alledged for dipping, we approve of, so farre as it excludeth not the other two. Fifthly, I except against the 41 Article, viz. “the persons designed by Christ to dispense this Ordinance, the Scriptures hold forth to be a preaching Disciple, it being no where tyed to a particular Church Officer or Person.” If the eye be darknesse, how great is that darknesse? If there be confusion in order it selfe, how great must the confusion needs be? If all be Pastours, where are their Flocks? If all be Teachers, where are their Scholars? 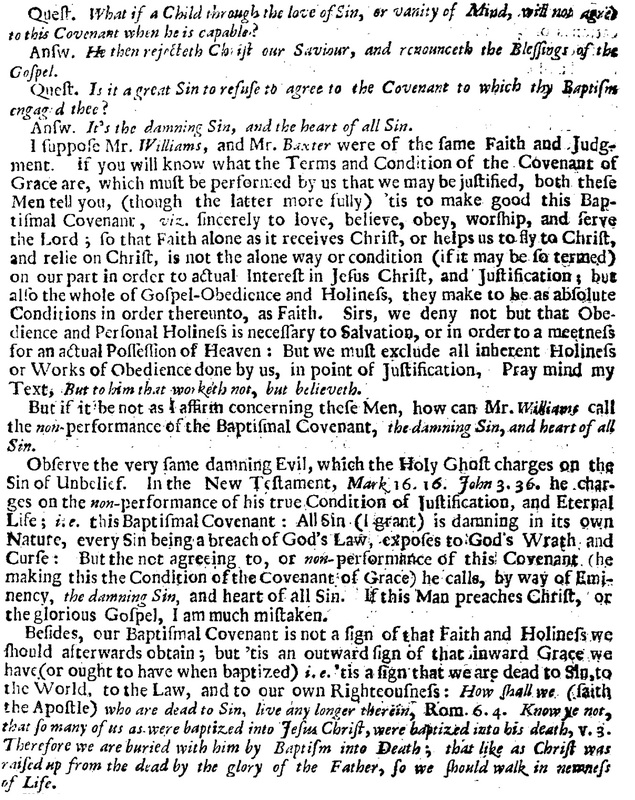 When Muncer, a seditious Anabaptist, first set a broach their doctrine at Mulchus, and took upon him to reform many things in Church and State; Luther advised the Senate to demand of him what calling he had to do such things he did; and if he should avouch God for the author of his calling, then they should require of him to prove that his calling from God by some evident sign; for whensoever it pleaseth God to change the ordinary course, and to call any man to any office extraordinary, he declares that his good will and pleasure by some evident sign. If the calling of the Anabaptisticall Teachers be ordinary, let them demonstrate it by Scripture; if extraordinary, let them prove it by miracle. For the prophesie they speak of, let them distinctly declare, what kind of prophesying they mean, and whom they esteem Prophets; for prophesying is taken in a double sense in holy Scripture; sometimes according to the propriety of the Greek derivation, for the prediction of things future: sometimes in a large sense, for reavealing the mysteries of God, and expounding his Oracles, either concerning things past, present, or to come.